Ever dream of escaping to a cozy cabin in the great outdoors? This unique bind-up of Conrad Meinecke's classic works helps make that a reality, while imparting a deeper appreciation of nature and of building something with your own two hands. 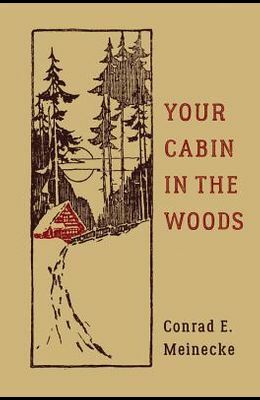 For 70 years, readers have been enjoying Meinecke's odes to the simple life, Your Cabin in the Woods and Cabin Craft and Outdoor Living . For the first time, these books are combined into a deluxe two-color vintage package. In writing both practical and inspirational, Meinecke details how to turn your cabin dream into a reality, from choosing land to using tools to the basics of construction. He provides hand-drawn floor plans for a variety of cabins, from a simple two-room to a more complex long house. A number of sections focus on the best way to build fireplaces, both indoors and out. He also provides instructions for basic furniture, lighting, and other touches that make a cabin feel like home. Throughout are Meinecke's thoughts on ways to enjoy your new-found space, from hearty fireplace recipes to the types of wood for a perfect fire and the beauty found in birdsong. Practical as it may be, the book's enduring appeal owes in large part to its warmly engaging tone and firm belief in the restorative power of nature and the satisfaction of hard work. He writes, Take full enjoyment in the building. Take time out to rest. Most city folks seem always to rush things through. Why? Lay off until tomorrow. Take an afternoon nap. Stop the clock for the weekend. Get off to an early start in the cool of tomorrow morning. You may be crowded in your work in town, but this should be your rest cure, your recreating.